No painful, toxic injections or electrocution - aka Frankenstein - here! Just a great way to tighten/clear the skin and look good! What is facial or body rejuvenation and how does it work? What are the machines used for skin rejuvenation? How does it work to nourish collagen and elastin? How many treatments will I need to improve my appearance/condition? Facial and body rejuvenation is a non-surgical, non-invasive, technique that uses no needles and safely delivers a variety of benefits to client/patient who wish to attain a healthier and younger appearance. IT IS COMPLETELY PAINLESS!!! A single treatment tightens the face and body by nourishing the existing collagen, elastin, and proteins, and at the same time, stimulates new cell production. The technology used in our office was developed over 25 years ago and was first introduced and marketed in Europe. 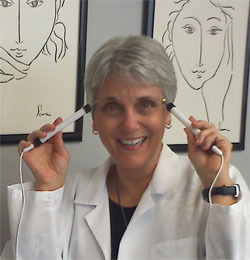 Dr. McWilliams, the inventor of the devices, also established Florida’s first school of acupuncture and homeopathy. After many years of use in Europe, the devices were then brought to the United States by Dr. McWilliams, who is also a naturopathic physician with a large, full-training clinic in the West Indies! The skin treatment stimulates the cells ability to regenerate collagen, elastin, and proteins naturally. This is accomplished by using a low-intensity radio wave device – the Jade machine – which is the only device in the world using light & color energy to include an additional energy of harmonic sound and gemstone technology. This technology is perfect for erasing fine lines and wrinkles, but it also controls and heals acne, scarring, and other skin disorders. The treatment actually decreases the size of large facial pores, and can even relieve tension headaches by restoring the skin’s natural cellular activity. The body rejuvenation, in addition to the face, can lift and tone the buttocks and breast areas, while relieving muscle knots and spasms, as well as decreasing the size and “ripple look” of the thighs and the upper arms. It can also tighten the abdominal area. Any body pain is almost always relieved immediately. The second device used is high-frequency energy light-emitting, and is used for lymphatic drainage. This device has the ability to remove toxins from the face and body by the induction of a flood of negatively charged electrons that penetrate the skin, terminating free radicals and increasing the oxygenation of the cells. This device will also treat hyper-pigmentation, sun damage and age spots on the skin and much more! A single treatment tightens the face and body by nourishing the existing collagen, elastin, and proteins, and at the same time, stimulates new production of all. With a series of treatments, results may last 3-5 years or longer! It is best to treat every other day, twice per week, or at least one time per week for a total of ten treatments. These treatments retrain the integrity of the muscles, rebuild cellular growth, and increase the strength of the immune system. Each device can be used separately, but using them together will provide breathtaking results. You will enter a very peaceful, delightful office with soothing, soft music playing in the background. You will then settle in comfortable wicker chairs with oriental motif, and after completing the necessary forms, you will be escorted to another beautifully decorated treatment room where you will find crisp, white-sheets, draped over a very comfortable and warmed treatment bed. You will lie down to experience a cozy facial or body treatment that you won’t soon forget! You will be very relaxed when you leave the Center…..completely de-stressed and looking younger. We sincerely look forward to your visit to our office – you will be happy you visited with us.